Fair warning: this post is just me thinking out loud about my dream scope. If you’d rather read about the stars, good on ya–there are plenty of other posts here about that stuff, that will be more interesting than this extended episode of navel-gazing about gear. Feel free to skip backward or–hopefully soon–forward. 1. It has to be enough of a gain over my current scope to be worth the expense. Some people say that small gains in aperture are not worth it, that you won’t notice enough of an improvement to make it worthwhile. I have looked through 8″ and 10″ scopes in quick succession, and 10″ and 12″ scopes in quick succession, and in both cases the gain in light gathering and resolution was immediately noticeable at the eyepiece. But it’s the “to make it worthwhile” part that’s the kicker. As we saw in What Aperture Costs, above 10″ prices increase sharply. As long as I’m saving up for my dream scope, I might as well save a little longer and get the wow factor instead of settling for a scope I’ll want to trade up from before long. 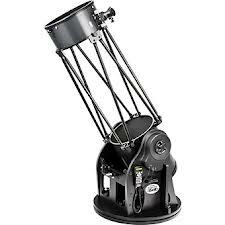 To really get the wow factor from a bigger scope, most people recommend doubling your light grasp–which for me means going from 10″ to 14″ (78.5 to 154 in^2)–or going one magnitude deeper, a factor of 2.5, which for me means going to 16″ (200 in^2). 2. It has to be small enough to fit in my current vehicle or any foreseeable future vehicle not specifically purchased for hauling around big telescopes. That means it has to be collapsible. But it has to be collapsible anyway, because I’ve had a solid-tube 12″ and didn’t keep it. In that case, the gain over the XT10 was noticeable but not worth it. And it still has to fit in a regular car. My friend Ron has a minivan that he bought specifically for hauling around his 22″, but I will probably never be in the position to base my vehicular purchases around my telescopes. 3. The pieces have to be light enough that I can set it up by myself. My friend Jeff has a collapsible 16″–it’s the scope we took on the LCROSS impact watch–but the mirror box is so damn heavy it takes both of us to get it up into the back of his pickup. I’d prefer a max weight for each piece under 75 lbs, and under 50 would be better still. If those sound like light loads for a healthy 6’2″ dude, go move big scopes around for a while. It’s like moving furniture–awkward weight with a center of gravity far from your body that makes the load on your back a lot worse than when you’re pumping iron. My XT10 weighs 55 lbs assembled. I can move it around in one piece if I have to, but I usually feel it in the morning. A 55-lb chunk of a bigger scope would probably be smaller, less awkward, and hurt my back less. Those conditions give me a range of options to think about while I’m saving up. For a long time, my dream-scope ideal was a T-Scope, a custom 14″ truss-tube dob with a low rocker box, starting at $3195. Pros: light, 65 lbs total and heaviest single component is 35 lbs; very high quality, very compact when disassembled. Cons: among the pricier options I’m looking at, cost does not include shipping from New York state (not a jab against T-Scopes, almost no-one has free shipping on scopes like these, it’s just one more thing I have to think about). UPDATE: another con is this negative customer experience reported on CN. I’m going to try to find out more about it–stay tuned. These days I’m thinking more and more about DobStuff. Dennis Steele makes big scopes that look awesome, weigh next to nothing, and cost surprisingly little for ultralight custom scopes. A 14″ weighs 70 lbs assembled, heaviest single component is 30 lbs, and goes for $2195. A 16″ would weigh about 90 lbs assembled, heaviest single component 45 lbs, for $3495. Apparently there is a price jump from 14″ to 16″ optics, which explains why the 16″ costs so much more than the 14″. Anyway, super-cool scopes that are pretty much exactly what I’m looking for. One CN member says his 16″ DobStuff has a footprint of 24″x24″ and sits in the back seat of his car when collapsed for travel. I need something like that. Turning to mass-produced scopes, there’s the Orion XX14i , a 14″ semi-truss dob, starting at $1899. That’s a lot of scope for not a lot of dough, especially considering it comes with digital setting circles (i.e., non-motorized “push-to” object locator). And I could drive to someplace that actually has them in stock and save on shipping. Downsides: compared to the other scopes I’m considering, it’s a pig. I call it a semi-truss dob because although it has trusses connecting the ends of the tube, and they do allow it to break down into smaller pieces, they don’t actually lighten the scope. Orion’s 12″ truss dob weighs just as much as the solid-tube version. The assembled weight is 120 lbs, and the heaviest single component is 55 lbs, as much as my XT10 and almost as much as an entire T-Scope. Also, there’s no way to get the scope without the digital setting circles, and it irks me to know that I’d be paying a few hundred more for a feature I’d happily do without. Finally, there have been some quality control issues; at least one Cloudy Nights user got an optical dud and Orion did not replace it, which is the first time I’ve ever heard of that happening. In fairness, Orion has apparently improved the quality of the optics shipping with the newer XX14s, so maybe–hopefully–the optical disappointments are all in the past. 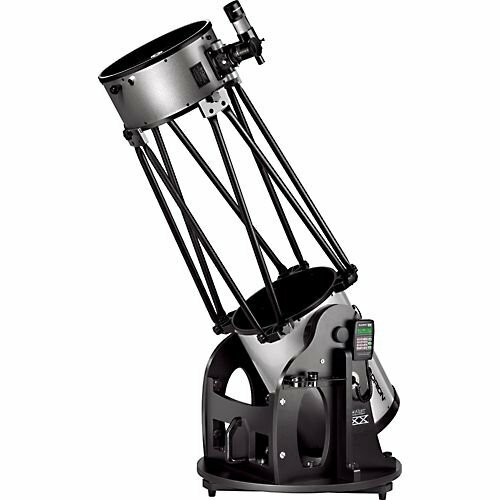 I discovered as I was writing this post that Orion has just introduced a 16″ semi-truss scope, the XX16g. Apparently it’s just like the XX14i but more so: more weight (195 lbs assembled), more cost ($3599), and more paying through the nose for stuff I don’t need–unlike the XX12 and XX14, which can be ordered in the “i” push-to versions or the “g” go-to versions, the XX16 is so far only available with go-to. So I’d be paying even more money for even more stuff I’d happily do without. I’m sure go-to is nice and if I had it I’d get addicted. My objections to go-to basically fall into three categories: (1) I spend at least half of each day working at a computer. I go stargazing to get away from all that. (2) At any given cost, adding electronics means taking away aperture. Given my limited budget, I prefer to buy aperture, for which there is no substitute, rather than electronics, which don’t do anything I can’t do myself with a star atlas and some elbow grease. * And (3) like all electronics, all go-to systems eventually fail. This is why Uncle Rod recommends buying CATs on equatorial mounts instead of fork mounts–EQ-mounted tubes are a lot easier to remount when the motorized mount craps out. I should say that these are my personal reasons for not wanting go-to for myself. If you have, love, or want go-to, that’s cool–may a thousand gardens grow. No need to sell me on it; it’s just not my scene, man. ** That’s funny, see, because Dobson actually was a monk (before he got kicked out for doing too much sidewalk astronomy). 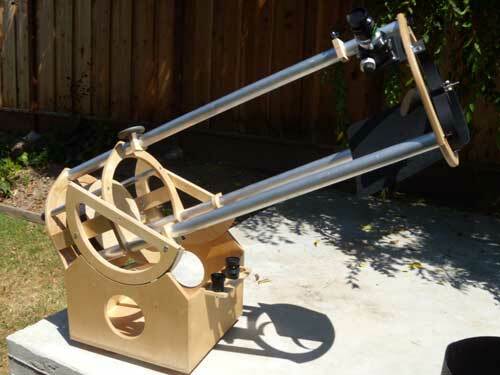 Meade’s 16″ LightBridge is a contender. At about $2000 it costs only a shade more than the XX14, but delivers a third again as much light. Another way to look at it is that it delivers the same light grasp as the XX16g for a little over half as much dough. The weight is high, but no worse than the XX14i: 128 lbs total, and heaviest single component is 58 lbs. Downsides? From everything I’ve read, the LightBridge series do not quite match the comparable Orion scopes on build quality. They seem to be “work in progress” scopes. This is especially true of the 16″–I’ve heard of lots of people who have rebuilt the base, which is apparently too wobbly for such a heavy scope, and Dennis Steele at DobStuff offers replacement base kits for just this purpose. When there’s a thriving aftermarket to fix the problems with a telescope as delivered, that’s a problem. I’m saving up for my dream scope, not a project scope. But it’s a lot of scope for two grand; even budgeting an addition $395 for a replacement base, it’s a solid deal. And it’s an affordable way to lay one’s hands on a set of 16″ optics. I realized something odd the other night. 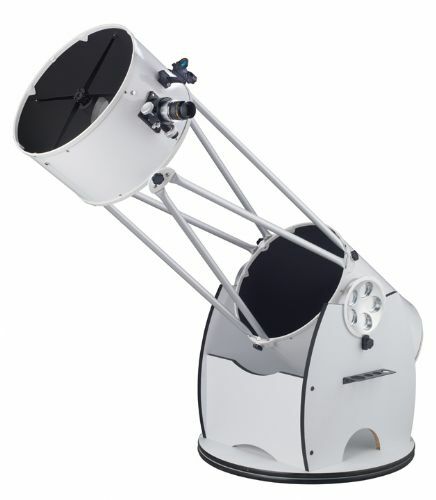 A 16″ DobStuff is $3495, but a DobStuff makeover, where you supply the optics, is only $895 for a 16″, plus another $150 for the Easy Transport Telescope option. So it’s actually about $400 cheaper to buy a 16″ LightBridge ($2000) and have it made over ($1045, for $3040 total) than to buy a 16″ DobStuff straight up. About the only risk I can see is the possibility of variable quality control in the LightBridge optics, although from what I’ve read the baseline quality is quite good and I haven’t read any horror stories. Two options I haven’t discussed are building my own and buying used. Regarding building my own, see comments above about dream scope vs project scope. And although I am normally a big fan of buying and selling used telescopes, I am a little leery in the case of my dream scope. If this is either going to be my last scope or my last scope for many years, I want to get exactly the right thing. I’ve already taken one poorly-considered leap into larger aperture and regretted it. I don’t want to make that mistake again. And yet…a used scope could just be a delivery mechanism for big optics. The other day someone on CN was selling a used 16″ LightBridge for $1500, and I have seen them go for even less. That plus a DobStuff makeover could be a faster, cheaper track to my dream scope than going all-new. It’s something to think about, anyway–I’m sure I’ll have plenty of time to consider, and reconsider, and rereconsider, etc., over the next few months and probably years. I love the technique and observing posts you do, but this sort of post about equipment, design and dreaming is right up my alley as well. Keep em coming. Following the last post on my blog about what size telescope I’m hoping to get, I was going to post something very similar where I surveyed the build/buy/assemble options to help convince myself that my decision to go the custom route was a good one. Your post is a near perfect encapsulation of my thoughts. I’ve not found any reviews of the whole system, but I’ve seen reviews of both the structure (used with another mirror set) and the mirrors themselves. Based on the review, and some info on the Hubble website, it seems like there may be some flexure issues when configured in certain ways, which would be my primary concern with such a gossamer structure. The mirror reviews seem generally good, and it’s the same basic mirror used in the DobStuff 16″ scope if I’m not mistaken. In any case it’s an interesting option I thought I’d point out. Buying a lightbridge for the optics seems like a wild idea, but pretty sensible! I’ve done some pricing on mirrors and it’s tough to find a custom 16″ mirror for less than $2000. With the lightbridge you’d get the primary, secondary, spider and focuser for that price. The only comparable deal I’ve seen is the primary/secondary sets sold by JMI. They sell Guan Sheng Optical (GSO) 16″ primary/secondary combinations for $1500. Reviews of GSO are generally positive and indicate good overall quality for a mass produced mirror. This is the mirror I’ve been plugging into my design/budget spreadsheet lately and it ends up being a very affordable scope when combined with the Dobstuff kit. Thanks for another great post, I hope you don’t mind if I point over to it soon on my blog. If you ever want to go visit the Dobstuff headquarters in Palm Springs, I’ve been thinking of making a pilgrimage at some point. First, I should thank you, it was reading your blog that really got me thinking about not screwing around any more and actually commencing to save up for my dream scope. As far as pointing to this post on your blog, feel free. My general policy is that it’s a free internet (or oughta be), and there’s no such thing as a bad incoming link, but I especially appreciate link-love from fellow amateurs going through the same struggles I am. Hopefully, we can all learn a bit from each other. Good point about the Obsessions. They are pretty much out of running for me. I know they have their followers, and God bless ’em, but if a DobStuff will do the same thing for lighter and cheaper, then my enthusiasm for going any further upscale is considerably diminished. I got very excited when I first saw the news about the Hubble UL16. The scope has the light weight and portability that I want, and the price is very attractive. Then I started reading actual observing reports. This thread on CN pretty much single-handedly killed my enthusiasm for the UL16. I don’t need to spend a month scratching my head, trying various fixes, and possibly machining parts (!) to get my dream scope to function properly. I need something that Just Works. Apparently the DobStuff scopes do just that, and the fact that I could drive out to Palm Springs and watch Dennis put my scope through its paces is a huge advantage to going that way. Incidentally, from reading around it sounds like the Obsession ultra-light line has had some mechanical issues, too. Not everyone, and not every scope, but enough to completely bury any lingering interest I might have had in going that way. Thanks for the heads up on the GSO optics. I was honestly unaware that you could the mirrors as stand-alone components. Most interesting! Thanks for the link to the CN thread. Very good reading. I had my doubts based on some other reports and this definitely rules out the scope for me. Ever since I saw similar scopes come around from Orion I’ve been interested in the UltraLight design, but it seems like even the best execution has the potential for major issues. The DobStuff scopes, on the other hand, seem very solid for their weight. I’ve never seen a bad review, and the few I’ve seen in person recently were very nice. I’m somewhat handy with tools, and I enjoy woodworking, so I’d probably opt to assemble the kit myself. Hopefully I can approximate the wonderful build quality that comes out of the DobStuff workshop if you buy an assembled scope. I’m really going to be diving into mirror options soon. If you run across any other suppliers or interesting ways to inexpensively acquire mirrors, I’m always interested. 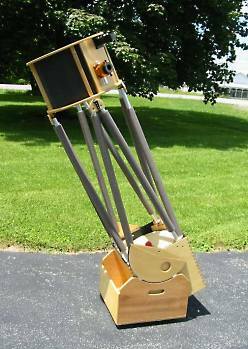 Let me make a firsthand review of the Lightbridge 16″: The telescope is heavy and pretty hard to move, but my grandpa, who’s age I won’t say can move it assembled by himself UPHILL for about 30 feet! The quality is awesome and it comes with some awesome eyepieces and a good reflex sight. In fact, this is the one that I installed custom on my observer 70mm. It is probabily good to buy it cheap on ebay or somewhere, but it’s definitly worth it.